Apr 29, 2018-World Intellectual Property Day was celebrated on April 26 under the theme ‘Powering Change: Women in Innovation and Creativity’. In general, gender disparities are visible in Nepal. In the music and film industry, there are more men than women. Nonetheless, the highest grossing Nepali film Chhakka Panja was directed by a woman, reminding us that women are no less innovative or creative than men. The existing legal framework provides limited incentives for women to encourage creativity and innovation. The Industrial Enterprises Act 2016 provides a 20 percent discount on the registration fee for enterprises owned by women. Similarly, the National IP Policy 2017 provides legal and administrative facilities. Barriers to copyright enforcement In recent times, the Nepali film industry has been vocal about copyright infringement, and rightly so because unauthorised use of someone’s work should not be allowed, and strict action should be taken against violators. The online piracy of Chhakka Panja, Chha Ekan Chha and Dreams stirred the Nepali film industry. Bhuwan KC, the director of Dreams, reportedly settled the piracy dispute with a hefty compensation. This year, the Kri team was accused of copyright infringement for using Shambhu Pradhan’s work. The dispute was reportedly settled for a payment of Rs1.1 million. Surprisingly, Bhuwan KC, who has been demanding stronger copyright enforcement, criticised Shambhu Pradhan for demanding compensation. This episode shows the mindset of the Nepali film industry. In most piracy cases, the music director or producer often claims the work to be original. However, the Copyright Act of 2002 leaves it to the court to determine the criteria for originality. Most copyright disputes do not go to court. Lack of awareness and flaws in the copyright law is the main reason. Under the Copyright Act, the author of the work cannot file a civil case in court against the perpetrator as the law considers copyright offences as state cases. However, civil remedies are available to the authors. This procedural burden is also one of the reasons why copyright cases are usually settled out of court. Most of the times, authors are reluctant to press charges because they fear being isolated in the movie industry. This will hinder creativity and lead to more cases of piracy in the film industry. Performing cover songs and uploading them to YouTube has become a trend in Nepal. Most people upload the videos without the author’s permission. There is always the possibility of copyright infringement. The court has slapped heavy fines in copyright infringement cases related to cover songs. However, one cannot ignore the fact that these cover songs help authors to reach a wider audience and gain some sort of celebrity status. There are success stories too. This month, the Ministry of Agriculture launched a collective trademark for tea and its implementation directive with the aim of standardising Nepali orthodox tea. Likewise, the Collective Rights Management Society successfuly got the laws amended to prohibit music from being played on public transport without paying royalty. A similar arrangement was made with Ncell and Nepal Telecom to ensure royalty payment for caller ring-back tones. The establishment of the Nepal Box Office by the National Film Development Board to verify the gross collection of Nepali films is an important milestone. And this is the right time for the film industry to exert pressure on the government to bring legislative reforms on intellectual property. Most importantly, the industry should be open and critical about their rights and obligations. In March 2017, the first National IP Policy was introduced with the goal of bringing legislative reforms within two years. In the past one year, there has been no concrete discussions on the planned legislative reforms. Hopefully, this year, the concerned ministry will take the initiative on legislative reforms. One important task which the previous government failed to do is ratify the Marrakesh Treaty to Facilitate Access to Published Works for Persons Who Are Blind, Visually Impaired, or Otherwise Print Disabled, which aims to end the book famine faced by such people. In 2015, the government had put ratification of the treaty in its priority list. Unfortunately, the subsequent government failed to give importance to the issue. If Nepal ratifies the Marrakesh Treaty, it will allow blind and visually impaired people to make accessible format copies without the author’s permission. Hopefully, this government will give priority to ratifying the Marrakesh Treaty. In the area of industrial property, the courts and the Department of Industry are slowly becoming open to recognising well-known trademarks. This is a positive step, but the Department of Industry still has a conceptual problem in understanding well-known trademarks which needs to be addressed. The digitalisation of trademark filing, transparency and accountability within the Department of Industry are important steps ahead. During Prime Minister KP Oli’s recent visit to India, he assured potential investors that Nepal was ‘a safe and stable destination for investment’. Indeed, after successfully holding the elections, Nepal is moving towards political stability, and a well-built balanced intellectual property system which ensures rights to the inventor and access to the public will stimulate innovation and facilitate investment. Although the federal government has the power to legislate ‘intellectual property rights’ as listed in the constitution, the provincial governments should also be involved at the state level to promote, publicise and strengthen the intellectual property rights regime. Nepal is in the midst of a political transition, and with its low level of economic and social development, it has remained behind in protecting IPRs. Explanation: For the purpose of this Article, “property” means any form of property including movable and immovable property, and includes an intellectual property right. I am sceptical about including intellectual property within the fundamental right chapter of the constitution, considering the changing landscape of the intellectual property system, which has become an integral part of trade, the regulatory system, and investment. I personally see intellectual property as a regulatory right rather than a property right. The growing internet access and inadequate legal framework to address online copyright issues are the biggest concern for Nepal. The recently drafted National Information and Communication Technology (ICT) Policy looks promising in safeguarding intellectual property issues online. The recent promulgation of a new Constitution (2015) and recently conducted Nepal Investment Summit (2017) encouraged the government to prioritize intellectual property to improve the investment climate in Nepal. These were some of the collective reasons for the first national intellectual property policy, which aims to create a balanced IP system in Nepal with a vision of “creating a creative nation through preservation and provision of intellectual property protection.” The policy sets out following objectives: (i) To encourage protection, promotion and development of IP (ii) To develop a balanced IP system (iii) To create awareness about the social, economic and cultural aspects of IP (iv) To encourage the commercialization of IP (v) To strengthen the legal, administrative and human resources to ensure protection and enforcement of IP. The policy mainly focuses on three aspects. First, it aims to revise the existing legal framework, recognize, and enact law related to geographical indications, petty patents, traditional knowledge/culture, integrated circuit, plant variety protection, trade secrets and biodiversity. The legal protection for geographical indications/traditional knowledge is very important for a country like Nepal, it can be used as a tool for rural producers to enter niche markets which will contribute to improving the living standard through increased incomes. Second, it aims to introduce various programs to create awareness and promote intellectual property rights. Third, the policy addresses the need to curb IP infringement and recommends revising penal provisions under the existing legal framework. Furthermore, the policy establishes a National Intellectual Property Council consisting of members from civil society, ministries, and experts to facilitate and advise on policy issues. There are shortcomings in the policy too. The policy looks very general, and not issue based. 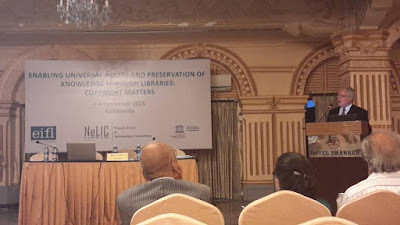 In 2015, Nepal successfully established a right to read campaign in collaboration with Electronic Information for Libraries and the Nepal Library and Information Consortium with an aim to pressure the government to ratify the Marrakesh Treaty on access for visually impaired readers. Previously, the government of Nepal was very enthusiastic about ratification and kept ratification of Marrakesh Treaty in its ‘priority list’ under a three-year action plan of the cabinet. Unfortunately, the subsequent government fails to realize the importance of Marrakesh Treaty and surprisingly the policy also doesn’t reflect the spirit of Marrakesh Treaty. The policy is brought with good intentions and incorporates issues in the most comprehensive manner. To conclude, the policy promises the rainbow dreams, which entrepreneurs, authors, farmers, and the industry has been dreaming in recent years. If the policy is taken seriously and all the proposals are implemented, then Nepal will be able to create a balanced IP regime based on its social, economic, and cultural practices. It would not be possible to make illegal copies of films without the involvement of the production team, but production houses are unwilling to initiate legal proceedings against team members. There is no lack of legal instruments and skilled enforcement mechanisms to control piracy, but what is missing is the will to act. The days are gone when the fear of police action was enough to deter potential perpetrators from engaging in copyright infringement. There is a need to prosecute pirates and take more cases to court. Meanwhile, the movie industry has taken positive steps towards fighting piracy. The producer of the movie Dreams, which was directed by Bhuwan KC, reportedly agreed to settle a copyright case in return for a payment of Rs2.5 million from those responsible for leaking it. This is the highest compensation amount received by a victim of piracy. This is a good precedent for Nepal’s cinema industry. Another important achievement last year was the licensing agreement made with Ncell for use of musical works as caller ringback tone (CRBT). A similar licensing agreement was signed with Nepal Telecom in 2014. This ensures economic rights to authors and provides an incentive to create. Perhaps, the Collective Rights Management Society should exert pressure on the Ministry of Physical Infrastructure and Transport and private transportation companies so that songwriters and musicians receive royalty when their songs are played on buses. There have been few attempts to develop intellectual property laws and policy after Nepal became a member of the World Trade Organisation (WTO). When the protocol on the accession to the WTO was ratified, there was the Patent, Design and Trademark Act 1965 and the Copyright Act 2002. They remain the main laws governing intellectual property rights. They have not been updated to incorporate technological advancements. Recently, the government endorsed the National Intellectual Property Policy 2017. It was issued right after the investment summit held last March. The policy aims to achieve economic prosperity by preserving, using and protecting various aspects of intellectual property. It highlights the need for a legal framework for geographical indication, plant variety protection, trade secret, biodiversity, integrated circuit, traditional knowledge and traditional cultural expression. This is an important step because Nepal possesses a wealth of geographical indications and traditional knowledge because of its geo-climatic condition. Moreover, geographical indications can be a tool for rural producers to enter niche markets and improve living standards through increased incomes. Similarly, the policy aims to create a single integrated nodal department which will manage all administrative work regarding intellectual property rights. Disagreements among ministries to create a nodal intergraded intellectual property department reportedly delayed the Intellectual Property Policy for years. It is noteworthy that the policy has suggested enacting laws related to petty patents or utility model which are the second tier protection for minor inventions. Utility model protection is granted without a very detailed examination and it doesn’t have a higher novelty threshold like patents. This is important for a country like Nepal because the nature of innovation depends on the socio-economic status and research and development. Therefore, the utility model law will be a stepping stone for creating innovative societies and utilising the capabilities of entrepreneurs and small scale industries. The policy has also suggested improving enforcement of intellectual property rights through civil and criminal sanctions. There are shortcomings in the policy too. It is very general and not issue based. Even then, if the government is committed to enforcing it, it will lead to important reform in the area of intellectual property in Nepal. The Nepali cinema industry has scaled new heights, and movie makers are actually making profits. This is something unheard of in the past. In the 1990s, the music industry had made great strides too, and sales had soared. 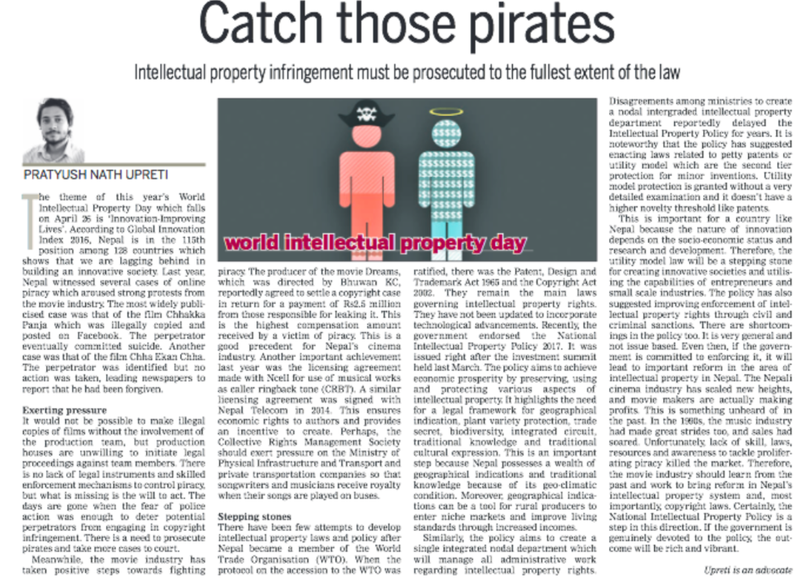 Unfortunately, lack of skill, laws, resources and awareness to tackle proliferating piracy killed the market. 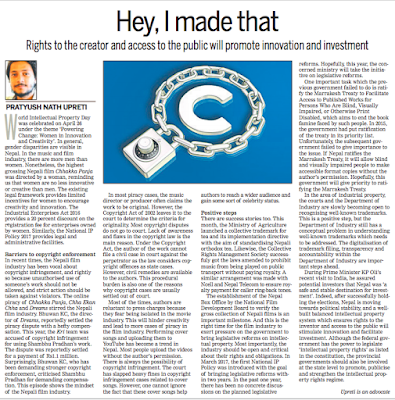 Therefore, the movie industry should learn from the past and work to bring reform in Nepal’s intellectual property system and, most importantly, copyright laws. Certainly, the National Intellectual Property Policy is a step in this direction. If the government is genuinely devoted to the policy, the outcome will be rich and vibrant. On June 30, The New York Times ran a news report: "U.S. Chamber of Commerce Works Globally to Fight Antismoking". Chief Secretary Leela Mani Paudyal said he had received an email from a representative of US Chamber warning Nepal not to devise strict anti-tobacco measures. The reason, according to the news report, was that such measure "would negate foreign investment" and "invite instability". In spite of such warning, Nepal introduced very strict labeling requirement in tobacco packaging. This highlights government concern about dire health effects of tobacco consumption and to some extent it could also be considered a breakthrough in resisting foreign influences. Every year tobacco consumption results in billions of death globally. Nepal is no exception. According to National Demographic and Health Survey 201l, 52 percent of men and 13 percent of women use tobacco in Nepal. The survey also reveals increasing tobacco consumption among women, particularly pregnant women, causing serious health problems. To minimize tobacco consumption, Nepal introduced plain packaging policy after ratifying the World Health Organization Framework Convention on Tobacco Control (WHO FCTC), an evidence-based treaty that binds ratifying countries to maintain highest standard of health. Basically, 'plain packaging' aims to control tobacco consumption by removal of all attractive and promotional features on tobacco package. Moreover, the Convention prohibits all forms of tobacco advertising, promotion and sponsorship that promote a tobacco product by any means that are false, misleading or deceptive or likely to create an erroneous impression about its characteristics and health effects. Even though plain packaging aims at greater public good, tobacco companies are more concerned about marketing their products. The very nature of plain packaging imposes a limitation on use of tobacco-related trademarks. Tobacco companies argue that such measures are incompatible with Agreement on Trade-Related Aspects of Intellectual Property Rights (TRIPS). In 2012 Ukraine, Honduras and The Dominican Republic initiated WTO dispute settlement proceeding against Australia regarding the Australian policy on plain packaging. Later, in 2013, Cuba and Indonesia joined the dispute. Basically, the allegation against Australia was based on the premise that such measures will severely limit the trademark holder's legitimate rights. In addition, it is alleged that there is no science behind tobacco ban. Last month, Ukraine, a party to the dispute, decided to suspend its WTO dispute over Australian's plain packaging measures for tobacco products, citing the absence of 'economic logic' in the dispute. At a time developing countries are struggling to implement strict labeling requirements, South East Asian countries have successfully incorporated plain packaging provision under domestic laws. Nepal has set an example by having a very high standard of plain packaging. Previously, the provision whereby graphic images of cancerous mouths and lungs would have to cover 75 percent of packets of tobacco products was challenged in court by Surya Nepal Pvt. Ltd. The plea was rejected by the Supreme Court on the ground of public interest. The government has realized public health concerns associated with such measures and last year introduced a new rule requiring 90 percent of surface area of all tobacco packaging to be covered with health warning. The new rules are consistent with the Interim Constitution where the state is obliged to improve the health of its citizens. Similarly, in India, the issue of plain packaging was challenged in Love Care Foundation v. Union of India & Anr. The court acknowledged the impact of plain packaging on public, and said that the effect of plain packaging "will spread public heath measure and could prevent the packets of cigarettes and other tobacco products from being a market tool for advertising brand image and promoting smoking as a status symbol, at no cost to the government." In the global context, there have been several attempts by tobacco companies to protest against the Tobacco Plain Packaging, with minimum support from the government. Most recently, international tobacco companies like Philip Morris have used investment law to claim compensation under International Investment Agreements (IIAs). The companies argue that such a policy is tantamount to expropriation of investments of tobacco companies. Furthermore, limitation on trademark use reduces the value of their brands and badly affects their investment. Additionally, plain packaging has affected the goodwill of these companies, which was generated through the use of a trademark. Such measures deprive tobacco companies of opportunity to distinguish their product from a competitor and diminish the commercial values of their intellectual property and goodwill. In Nepal, the tobacco industry is not a significant driver of the country's development. Therefore, attempts by tobacco companies to protect their brand's goodwill didn't garner wide support, considering what was at stake: the health of the public. Nepal has laudably introduced the landmark '90 percent' labeling policy, showing it is concerned about citizens' health, thus leading by example for other countries. However, there are enormous challenges when it comes to implementing and monitoring plain packaging, not the least the unregulated small manufacturers of tobacco products. Their activities need to be curtailed too. Every year, 26th April, is marked worldwide as World Intellectual Property Day to ‘promote discussion of the role of intellectual property (IP) in encouraging innovation and creativity’. This year, theme of world IP day 2015 is ‘Get up, stand up- for music’. 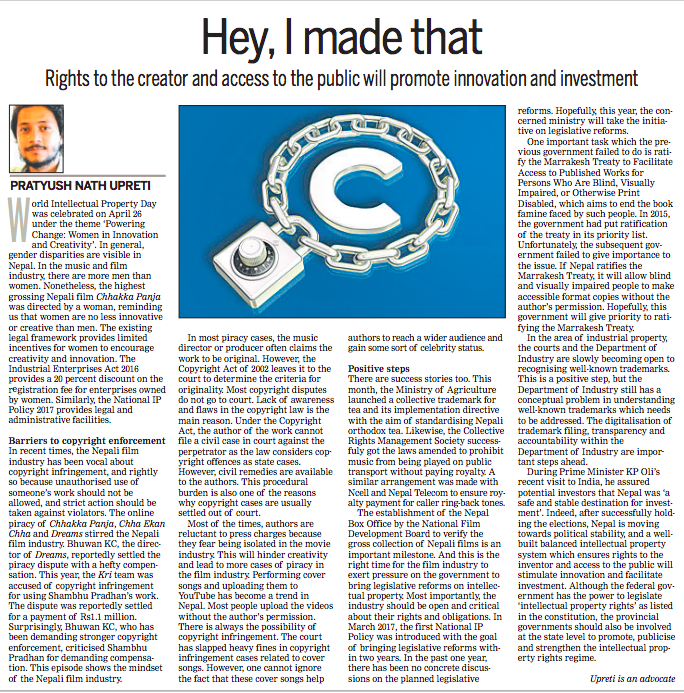 In recent years the music industry has been facing serious problems of copyright infringement through digital media and increasing cross-border piracy.. Let’s examine where Nepal stand on Intellectual Property rights. In my previous contribution to the post, titled “Mind gains” (February 2, 2014), I have analyzed overall status of Intellectual Property in Nepal. It’s very unfortunate to say that, not thing have changed than previous year. 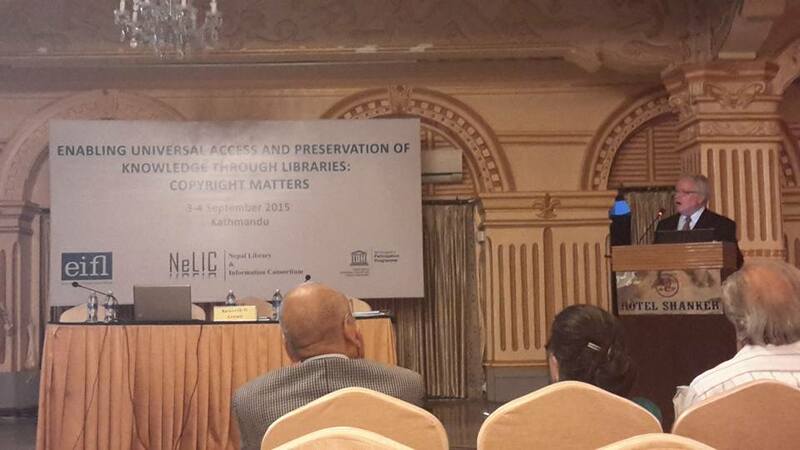 Nepal still lag far behind in protecting Intellectual creation. According to the International Property Rights Index (IPRI) 2014 global ranking, Nepal remains the weakest in protecting Intellectual property, by securing 78th Position out of 97 countries. Similarly, Nepal ranks 14th in the Asia out of 16th countries. Similarly, last ten years filling trend of intellectual property is also not encouraging. It shows, Intellectual Property has been very much ignored in Nepal. At present, there are two barriers to development. First, inadequate legal instrument and second, lack of awareness and expertise in the subject. At most, music industry has suffered a lot. Historically, music has played a major role in democratization of culture and language and to a extend medium to communicate with people. For example, during Maoist insurgency, they used music to communicate with people and in a way seek their support. During the era, Maoist had their own FM station, where songs played to spreading the message of equality, rights and inclusiveness among others. It actually helped the moist to spread their agenda and also received support to some extent. Similarly, during Jan-Anadolan II, patriotic music was often played in rallies and protest show the unity among the people. Likewise, music has also helped the Indigenous community (Janjati) to advocate their rights and their cultural identities by playing music at several event to show that their language were part of Nepali culture. Therefore, music have played significant role in our society and it’s very important to create an environment where artist can get fruits of their labour and encourage creativity. When music is created, its not only singer, songwriter, musician, publishers, arranger and many others are involved in creativity. At the moment, music industry is suffering from rampant piracy. Music industry in Nepal is small but growing. However, the hindrance of its growth is piracy. South East Asia is considered to be one of the pioneers in music piracy and Nepal is no exception to it. Unlike China, Nepal does not have cultural root of ‘copying’, but in recent years the copying and buying pirated songs/music have been so habitual, that we prefer pirated. This habitual practice has severe impact not only on music industry but also to artist. In Nepal, an artist cannot imagine to live his life on sale of music. Their earning is mostly depends upon the music concert. Till recent years, piracy was witnessed through pirated CD/DVDs and portable medium like pen drive etc. The beauty of music industry is it’s changing music. Like taste of music has changed, similarly the medium where it is distributed and consumed has also changed. Recent Nepal Telecom data shows, 38.78 percentage of population have access to Internet. The Internet plays an important role in piracy, it gives platform like YouTube to share pirated music/ movie. The recent victim of such online piracy was ‘Kohinoor’ movie, which was pirated through uploading sites like, YouTube. These problems are well identified previously, but not much of measures of have taken my government to cope with copyright infringement. 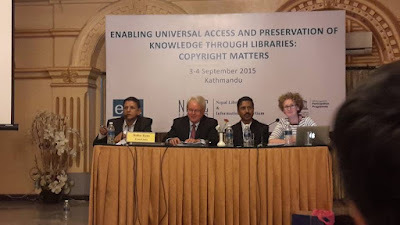 Nepalese Copyright Act, 2002 and Copyright Rules, 2004 were enacted in order to address new challenges in copyright and to ensure compliance with minimum requirement laid down by the TRIPS Agreement. The Copyright Act does not address any challenges faced by technological advancements; it’s an outdated copyright law with so much gaps that any infringer can easily bypass. Although the law has both civil and criminal remedies available to prevent infringement, the quantum of punishment is very low. Under criminal remedies, THE law prescribes a minimum fine of Rs 10,000 up to Rs 100,000, six-month imprisonment, or both. It looks as though the copyright infringer does not have much to be afraid of. The law needs to be amended to address several issue of digital copyright. For example, the liability of Internet service provider upon failing to control infringement goods or knowingly providing forum for infringement. Enforcing copyright itself is challenging, and now with digital media, it had made more difficult. However, problem does not lies on legal remedy, the right holder must be aware of the situation and should act to curtail the infringement. Unfortunately, there are instances were right holder even after identifying the culprit, have let them go. Such acts certainly encourage piracy and perceptions of pirated use get more habitual. No doubt, piracy is important issue to be addressed. The broader concerns, lies on overall development of Intellectual Property rights, which is very much overlooked by the government. Nepal lack’s laws on Geographical Indication, Plant variety/breeder’s rights, which would be tool for rural development. Due to lack of laws, the potential geographical indications like Iiame Chiyaa(IIam tea), Jumli marshi (rice from Jhumla), Nepali Kagaz(hand made paper) etc which is exported worth of millions in international market particularly, United States and Europe, is on verge of getting genericide. 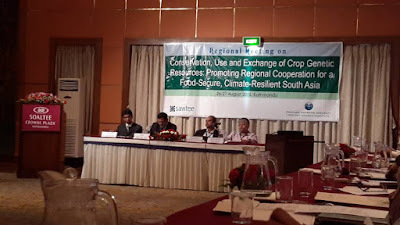 Considering the geo-climatic condition of Nepal, Geographical indication will act as a tool by which rural producer can enter into niche markets which will contribute to improving living condition through increased income. In addition, Nepal has also failed to protect traditional knowledge and indigenous skills. Furthermore, political instability has discouraged research and development. Although Nepal hopes that bilateral investment promotion and protection agreement (BIPPA) would attract foreign investor. From IP aspects, only concern with such agreement is that the definition of investment includes Intellectual Property. Therefore, without proper IP Policy, such agreement gives burden to state. As IPRs are integral part of regulatory system including taxes, investment, regulations, trade policies. So, there is need of concrete national IP policy. Although intellectual property grows when there is more investment vis-a-vis research and development. But it cannot be ignored that small-scale industries are very much growing and are unaware of intellectual property, which would be used to protect their product from competitor as well as helps in branding the products. Thus, current Intellectual Property situation of Nepal is very painful. The present laws are below the minimum standard and few aspects of IP are still not protected and existing enforcement is very weak, overall discouraging innovation and creativity. The fate of draft Intellectual Property Bill is unknown. Let’s hope this year, government comes with comprehensive IP Policy, which is of immediate need. Nelson Mandela’s image, name and quotations have been registered under the proprietorship of the Nelson Mandela Foundation as per South African trademark laws. They are registered under several classes including jewellery, clothing, books and other products. Furthermore, other proprietors of the Mandela brand include the Nelson Mandela Children’s Hospital Trust, Nelson Mandela Metropolitan University and the Nelson Mandela Children’s Fund. Infringement and unauthorised use of this brand name was seen in South Africa in the form of commercial use of his image which has raised concern among his family. Following this prologue about intellectual property rights in South Africa, let’s examine where Nepal stands on this front. Intellectual property rights (IPR) refer to the legal rights owned by individuals and organisations on inventions, designs, goods and other creations produced by intellectual activity in the industrial, scientific and artistic fields. 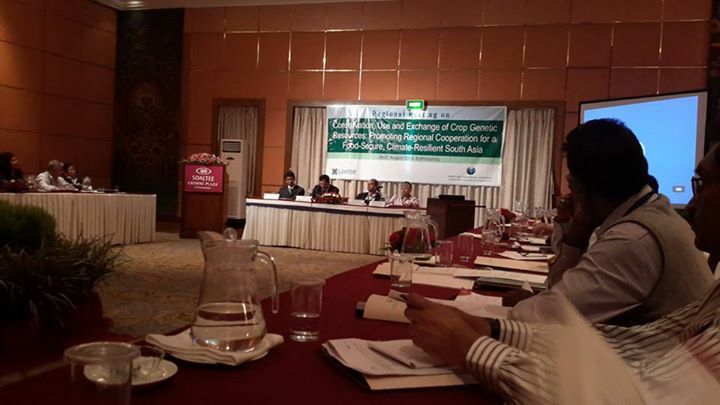 Nepal is in the midst of a political transaction, and with its low level of economic and social development, it has remained behind in the protection and enforcement of IPR. However, the major concern is an inadequate IPR legal framework. Despite Nepal becoming a member of the World Trade Organization (WTO) on April 23, 2004 and subsequently accepting the obligations under Trade Related Aspects of Intellectual Property (TRIPS), the legal and policy framework is still confusing. Article 35 (11) of the Interim Constitution states, “The State shall pursue a policy of giving priority to the development of science and technology with a view to bringing about prosperity in the country, and shall also adopt a policy of giving due consideration to the development of local technology.” This provision gives the responsibility of making the necessary arrangements for the protection and promotion of intellectual property to the state. In addition, intellectual property also comes under the purview of freedom of speech and expression guaranteed by the Interim Constitution. However, under the present IPR legal regime, we have two major pieces of legislation in Nepal: Patent, Design and Trademark Act 1965 and Copyright Act 2002. In addition to this, we have three ancillary legislations which are related to IPR. We do have a pending Intellectual Property Bill, but it is inadequate and lacking in several aspects. At the international level, Nepal is a signatory to 33 memberships including multilateral, bilateral and regional economic integration treaties. The question is: Are our laws adequate according to these treaties? Do our laws address the challenges that arise due to technological advancements? Furthermore, a recent report of the UN Interregional Crime and Justice Unit (Unicri) says that organised crime groups have moved towards cyber crime and intellectual property theft because of weak enforcement making them highly profitable. So are our laws adequate to challenge such issues? Besides legal reform and advocacy, there is also a need to develop a manufacturing-friendly environment. How can the IPR regime be developed when there is no research and development? Most importantly, Nepal is very weak on the supply front. We are highly dependent on imports. This unfortunate situation is a cumulative result of several factors, mainly political instability and electricity shortage. In addition, we have witnessed much interest in short-term investments like real estate. Recent trade status reports clearly indicate that there is an imbalance between imports and exports. According to the Intellectual Property Index Rights (IPIR) global ranking, Nepal is in the 95th position out of 130 countries. Similarly, Nepal ranks 113th out of 130 in the legal and political environment category. When the legal and political environment is in such turmoil, it is certainly silly to expect much development in the country. However, that does not mean that we should remain as bystanders waiting for things to happen. Thus, we need good brains to bring up issues to make the most out of Nepal’s geo-climatic condition. In a least developed country like Nepal, geographical indication can be used as a tool for rural producers to enter niche markets which will contribute to improving the living standard through increased incomes. Geographical indication has a great economic potential, specifically rural development potential. Till date, we haven’t recognised its potential, unlike in India. After the Basmati rice saga, India opted for full protection for geographical indication by ‘sui generis’ (of its own kind) legislation. After that, potential products like Darjeeling tea were registered as geographical indication, which has helped rural communities to raise their living standards. So it’s high time we had sui generis legislation for geographical indication. Similarly, Nepal is one the richest countries in the world in terms of biodiversity, but we have not been able to exploit its advantages because of an inadequate bio-diversity legislation. And because of lack of a proper regulatory framework, plant breeder and farmer rights have not been secured effectively. It is very unfortunate that we have not been able to protect traditional knowledge and indigenous skills. We need strong legislation to protect these issues. People often see IPR as a capitalistic issue, but I believe there are many human rights issues involved. How much have we benefited from the WTO? How can we benefit from TRIPS? Did we benefit from the recent WTO Ministerial Conference held in Bali? No matter how many international instruments we sign, we will never benefit from them unless we create an environment to enhance and encourage research and development. Along with legal reform, another challenge is awareness because lack of awareness about IPR means minimum interest in its protection. Thus there is a need for strong advocacy to secure intellectual property rights.